Hronis Racing's Accelerate has been scratched out of Saturday's Grade 2 San Diego Handicap, according to bloodhorse.com. The 5-year-old son of Lookin at Lucky is fine and will breeze on Sunday morning, said trainer John Sadler, in anticipation of a possible start on the east coast. 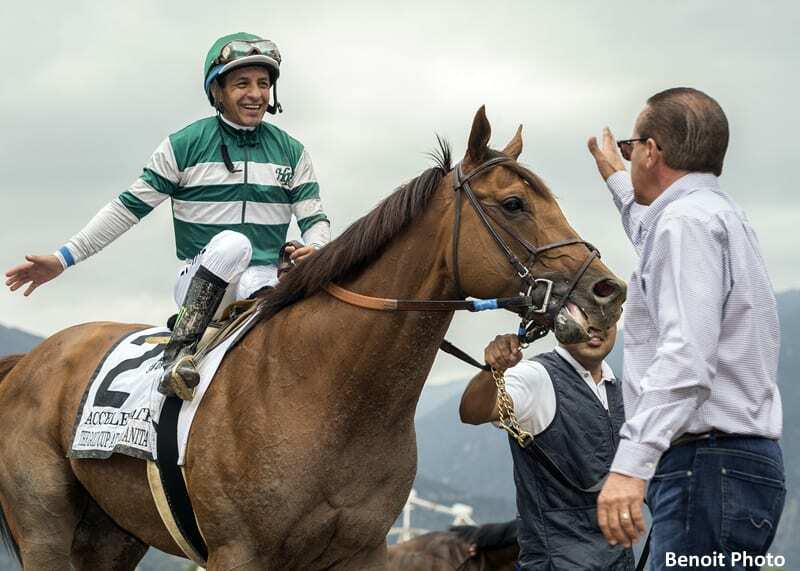 Accelerate's scratch was effected because of the presence of two of his fellow Hronis-owned stablemates in the San Diego lineup: Catalina Cruiser and Curlin Rules. This entry was posted in Racing and tagged accelerate, catalina cruiser, curlin rules, Del Mar, del mar thoroughbred club, hronis racing, john sadler, Kosta Hronis, lookin at lucky, San Diego Handicap by Paulick Report Staff. Bookmark the permalink.